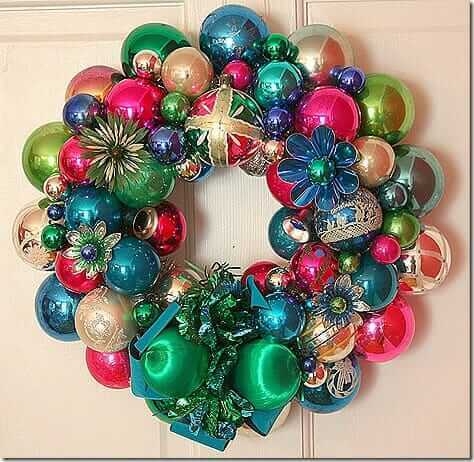 Home » Holiday » Wreaths » Video tutorial — Make a vintage Christmas ornament wreath — 3 hours into 4 minutes time lapse wow! With all the fun Pam is having making vintage ornament wreaths, I wanted to get in on the action too. So I reread her tutorial and 30+ tips to make a vintage ornament wreath… busted out my glue gun — and my camera… and dialed up the epic to create this new Retro Crafty video. This video how-to is a doozy folks. There are oodles of ornaments, time lapse wreath arranging, and a cameo appearance from my helpful assistant Leo. Yes, making this wreath was a whole lotta fun. Now I understand why Pam has gone into ornie overload. So sit back, relax and watch me cram three hours of work in to four-and-half minutes of action-packed magical merry wreath making. 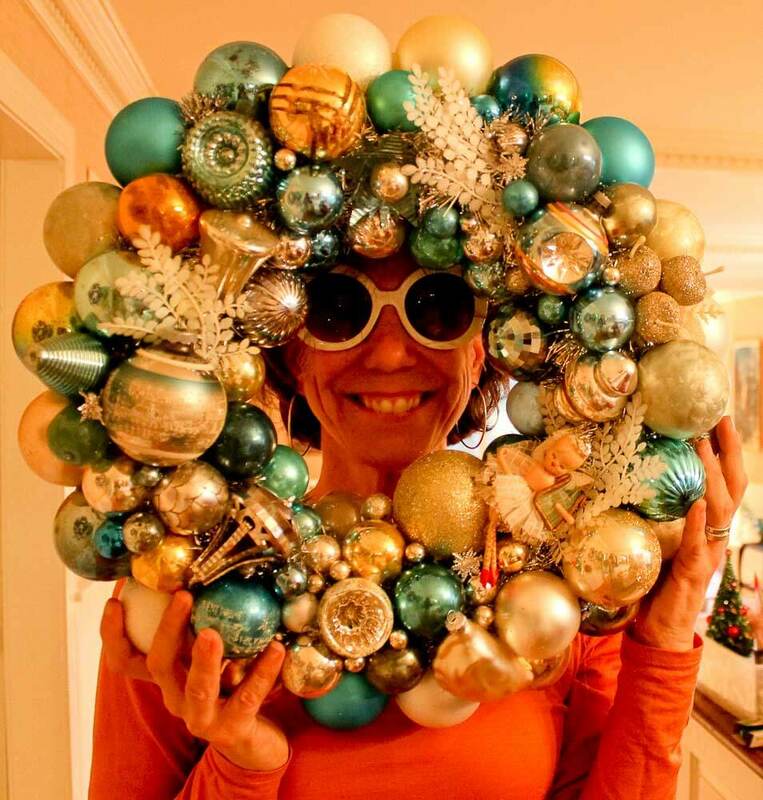 Thanks again to Georgia Peachez — queen o’ the vintage ornie wreaths — for the inspiration and for her generosity in sharing her wreath-making tips with us. If you doubt you’ll ever get this retro crafty, we think the best place to keep up with her wreaths for sale is via her Facebook page. What a great way to make use of ornaments which look fantastic but won’t fit on the tree! Very, very pretty! I love that you used vintage ornaments on it. Whoa! I’m still back on Step One: trying to figure out how to use a glue gun – I ordered that Surebonder from Amazon and the dang thing arrived with NO instructions – wasn’t even packaged in the plastic as pictured on the blog ad which might have at least had a photo how to load it. Seriously, I have never tried to use a glue gun, ever! I think I’m a little, well…… SCARED, after reading Georgia Peachez’s comments about all the blisters on her fingertips. Was very happy to see you appeared unscalded as you sipped your martini, Kate! Any tips? I do wish you would have started out in “real time” for at least 30 seconds to see how much glue to apply, where you glued the tinsel garland, how to do the hanger etc. 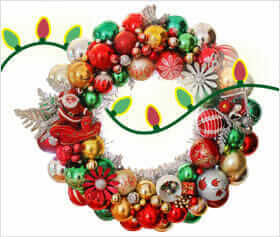 Your wreath is just wonderful!! Ummm, you know how I feel about giving safety advice. Does Surebonder have a website? Also, read my written instructions with 30+ tips – there is a link in the first paragraph. I discuss dabbing and the hanger, etc. I was thinking more: Are you sure you didn’t accidentally buy a used unit? Mine had packaging for sure. Anyway… one dab to attach to wreath — maybe half the size of a dime is what I’d say I did — then if you want to double dab onto an adjacent ornament, just a weebit. You can even do the ‘adjacent’ dabs at the end if you want. You will be able to tell if the ornies feel secure. 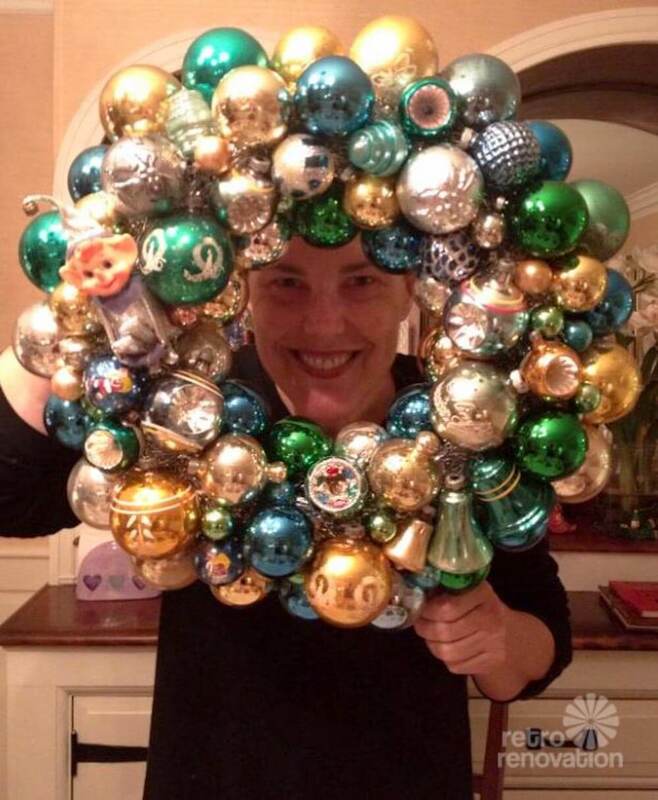 When I had my first wreath-making with Danielle, I had never used a hot glue gun either. It was good to have a friend who knew how to do it. Another tip she taught me: Line a metal pie plate with aluminum foil — use this as sort of the place where you rest the hot glue gun. Another idea: Look at Michaels — maybe they are having a DIY session that involves hot glue guns that you can attend? Or, one of their folks could help you? Diane — I have lots of glue gun experience so I don’t really burn myself much or at all these days. Plus — that “martini” was just water. I didn’t want to drink on the job. Usually I do all my glue gun work sober and then celebrate a project well done with a cocktail. It does take some practice to know where to apply glue so that your fingers stay clear! Glue guns are not hard to operate, just make sure to use the right diameter glue stick, it loads through the round hole in the upper back, then plug in the gun and let it heat up for about 5 minutes. the metal piece that shipped with that glue gun is a stand that attaches to the front of the gun, so the gun can stand up by itself. Pam’s tin foil lined pie plate trick is a good one, otherwise, make sure you have some scrap paper or cardboard to set the gun on so it doesn’t damage the surface of your crafting table. Glue guns are much less scary than table saws — as long as you are careful, you’ll do fine! I will also pipe in: I just started using the glue gun, and I burned myself very few times. Usually it happened when I went to adjust and ornie that had hot glue on it. Beware the hot glue whether it’s on the gun – or on the piece. Thank you for the comments and tips!! Very helpful. I did NOT get a used glue gun. Brand new but packaged in a plain white box with no instruction sheet etc. Got the specified Surebonder glue sticks that were the “add on” for the Surebonder gun; should be good-to-go there…..
I’ve decided to make my wreath AFTER the Christmas Holidays, when entertaining and cooking fancy stuff and wrapping packages is over and blister-y fingertips won’t be such a handicap. And your recent comments will be saved for reference so thank you both! Diane, I suspect your glue gun may have been one someone else returned. I would definitely complain to Amazon, because you did not receive the complete unit.